Supplier & Manufacturer of Empty Capsule Ejection Machine. Our product range also comprises of Auto Polishing Machine, Automatic Capsule Filling Machine and Semi-Automatic Capsule Filling Machine. Backed by our professionals, we offer our clients a wide array of Empty Capsule Ejection Machine. 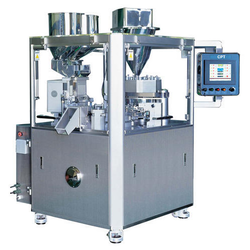 The Empty Capsule Ejection Machine is designed to sort out empty capsule or Partly filled capsules. Our products are highly demanded in market because of their superior quality and economical price.